If you have had the pleasure of watching Wolves play, whether it be at home or away, at some stage you will hear their fans singing about how their manager Nuno Espirito Santo had a dream. The start of it goes, ‘Nuno had a dream, to build a football team,’ other notable points in the song refer to their wealthy Chinese owners as well as a wonder kid from Porto who is Ruben Neves. After Wolves’ impressive start to the season, it’s fair to say that this dream of Nuno’s is fast becoming a reality if it hadn’t already after they blitzed the Championship last season. The Portuguese manager has arrived in the Premier League with his Wolves side and instead of just trying to survive by frustrating the opposition, he has instead taken the game to the established teams in the top flight and isn’t only bloodying a few noses but leaving teams knocked spark out on the canvas. The Wanderers are playing an exciting brand of football and the results are paying dividends with wins over Southampton and West Ham, and a draw at Manchester United all in the month of September. This fine form has seen Nuno named September’s Manager of the Month which is just reward for an exceptional run that has seen Wolves collect 10 points from a possible 12. Right now, Wolves lie in seventh position in the league table and only five points behind league leaders Manchester City. When assessing the Premier League odds for the 2018/19 winner you instantly see City are favourites at 4/6 but could Wolves be considered realistic title challengers? It’s a question that is likely to be scoffed at but no one would have predicted Wolves would have only lost once after eight games having played the likes of Everton, Man City, and Manchester United. Nuno’s men were able to hold Guardiola’s City to a draw at Molineux in August and it was then that those who didn’t already know what Wolves were about would quickly find out. Vincent Kompany waxed lyrical about Wolves after that game and said that they would take points off City’s rivals. It looks like Kompany was on the money with his assessment and Wolves aren’t likely to fall off the pace dramatically like promoted teams seem do after they hit the ground running in the Premier League, only for the wheels to fall off. In fact, the only impending disaster at Wolves could be Nuno being poached by a bigger club. There were whispers that the board at Manchester United were massive admirers of the 44-year-old and would like him at some stage to take over at Old Trafford. With chaos reigning at Old Trafford, you just never know what could happen next. There’s very little chance that Nuno would be out of his depth either and his straight-talking style would leave few in any doubt as to who was boss. For now, the Wolves dream goes on with their leader Nuno steering them towards big things. Even though it has been several weeks since the release of the fixture list, the gravity of some opening day fixtures is not lost on anyone. It seems somewhat fitting that – albeit alphabetically – Arsenal vs. Manchester City should stand proudly atop the list. Despite Arsenal having home advantage, with an atmosphere bolstered by the presence of Unai Emery on the touchline, City are odds-on, or at least at evens, across the board to take the points. In one case, the champions are a mere 13/2 to beat Arsenal by at least three goals. 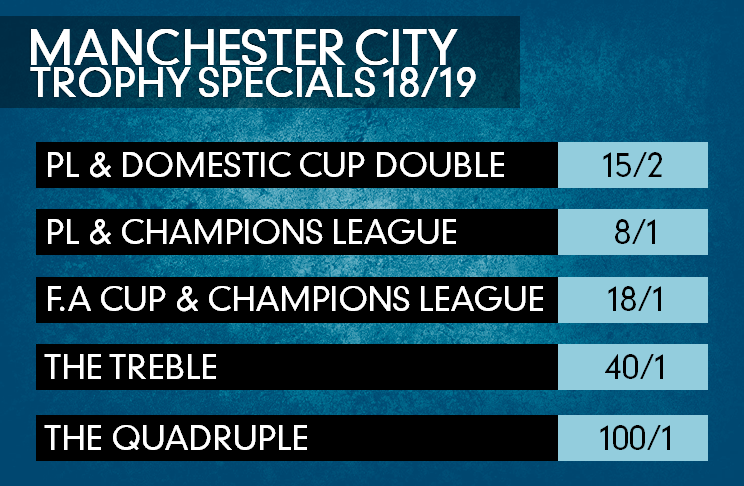 With Manchester City also having ‘trophy specials’ prior to 2018/19, there are no prizes for guessing which team the bookmakers have their own money on. Unquestionably, from a betting perspective, this match will be the main draw of 2018/19’s opening weekend, especially those that want to use a free bet calculator after including the match in an accumulator. The match will mark the twentieth time that Arsenal FC has opened a Premier League (PL) season on North London turf. Goals galore at the Grove? Openers at Arsenal seldom want for goals, and with an outcome yielding over 2.5 goals odds-on across the board, this could easily be a classic. Only one of the nineteen Highbury/Emirates PL openers to date has produced a 0-0 draw; namely, when the Gunners hosted Sunderland in 2012. A repeat of that 0-0 scoreline, between Arsenal and City, is priced at an average of 352/25 in current correct score markets. By contrast, three or more goals will see Arsenal become the first Premier League club to host over 100 opening day goals. 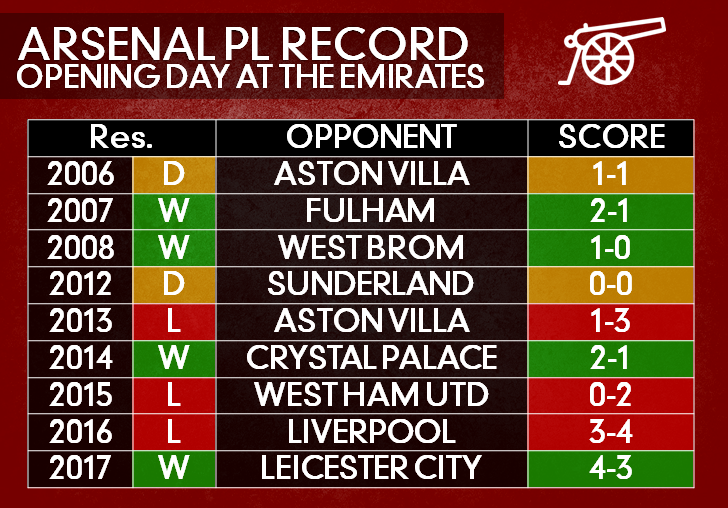 Though Arsenal F.C has been granted an extraordinary number of home openers in the PL era, it has not always gone to plan for the Gunners. The Manchester City of 2018 is an entirely different entity from what it once was but, for what it is worth, this is the second time the fixture computer has fated City to open at Arsenal in the PL era. The first occasion was in 1994 when Arsenal strolled to a 3-0 win against a club about to embark on a Lucifer-esque fall from grace through the leagues. With the tally currently at 97, the average per game is 5.10. An aggregate score involving seven or more goals will also make it the third season in succession that the Emirates has seen such a goalfest unfold – unheard of in the age of offside and (now) VAR! Despite finishing 2017/18 with 100 points, Pep Guardiola’s nigh-unplayable Manchester City squad has plenty of reason to be wary. The reigning PL champions from a previous season have now lost in successive years for the first time ever. Indeed, it was not until 2016 that any champion (Leicester) lost a PL opener. A failure for City to win will make it four years in a row that a reigning champion has failed to win an opener, with three already a record in any case. Regardless of the newly-impoverished record of reigning champions on the opening day, the club is on a run of seven straight opening day wins. Pep Guardiola can also take encouragement from City’s recent PL record in away openers under the Khaldoon Al Mubarak regime. City squads have scored twice as many (10) as they have conceded (5) on away openers during that time. If the 4-2 away defeat to Aston Villa (August 2008) is taken out of the equation, City squads have conceded just 0.2 goals per opening day road trip since 2009. The Premier League needs a final day relegation battle as it needs it for a dramatic narrative. Only fans of the sides involved are interested in what happens at the top of the table but the relegation battle is a soap opera that nearly always has its final meaningful act on the last day. It would be a shame if it didn’t this year. Maybe, as a storyline, the Premier League will stagger over the end-line in bland fashion. The alternative though, is that potentially eight teams could still be in the mix for one final Battle Royale. West Bromwich Albion’s recent victory over Manchester United has fueled hope of this being a possibility. With Alan Pardew parting ways with the club and seemingly ending his cycle of Premier League jobs, the Midlands club looked dead and at least half-buried. But their 1-0 win has given them a bounce and if ever there was a time to build on genuine momentum, it is now. Next season could see the return of Tony Mowbray back at The Hawthorns. 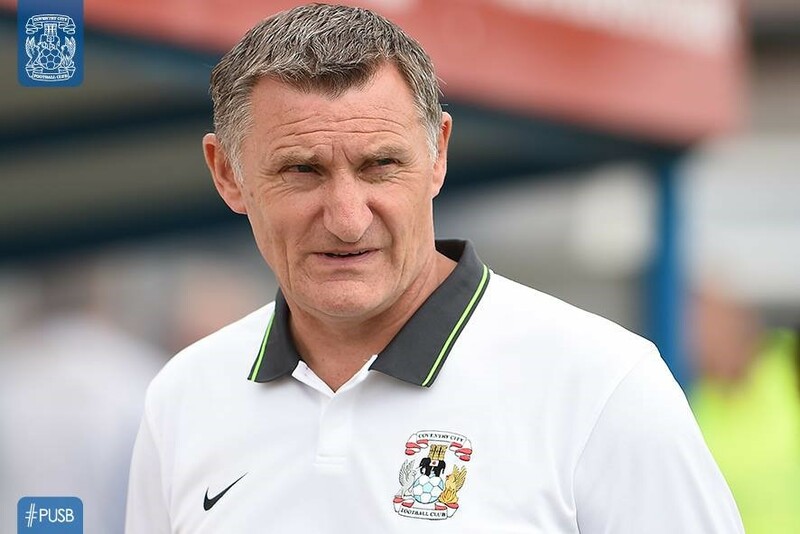 Currently proving something of a success at League One side Blackburn Rovers, Mowbray has grown as a manager since leaving the club following relegation in 2009. Fondly regarded, he could see his return to the club as a Premier League club, if things continue to make a dramatic turn for the better. The more likely scenario is that, if the former Celtic player and manager does return, it will be with the team plying their trade in the Championship. West Brom’s remaining games will see them as unlikely to be favourites with the likes of Sportsbet based on the calibre of their opposition. 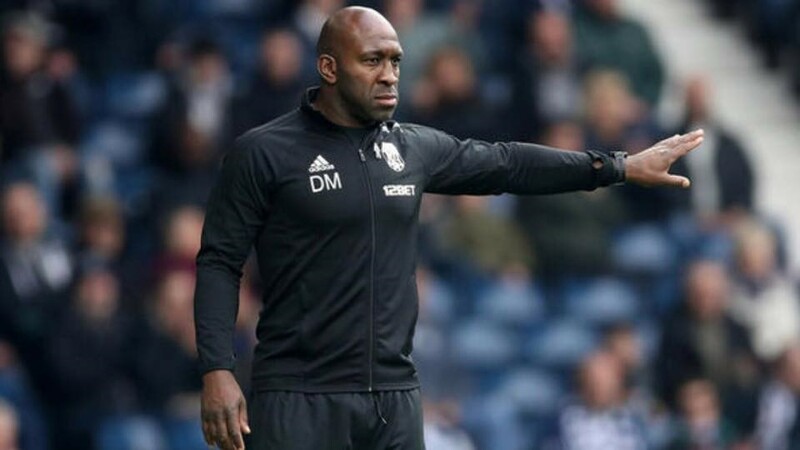 If there is a game where they might see themselves as in with a chance of winning, it would be on the last day of the season in a potential crunch meeting with Crystal Palace but caretaker manager Darren Moore has his work cut out for him before that fixture. The visit of Liverpool sees a team in unforgiving form in front of goal. However, Jurgen Klopp’s side have their Champion’s League run as a considerable distraction. An aggressive approach against Liverpool with caution thrown to the wind in attack, whilst remaining stoic in defence as they did at Old Trafford, is a must. If not, it will be an invitation for Liverpool to impose more of their adroit attacking game. With more to lose, West Brom will need to take bigger risks. The same is to be said for the visit to Newcastle. Rafa Benitez’s side secured their top-flight status in their recent 2-1 win over Arsenal. Regardless of their public statements of intent, this will be a very good time for the Baggies to play them. How good a time though it is to face Tottenham Hotspur though, is another thing. Whilst Champions League football next season is practically sealed, the difference between third and fourth place is relevant, such is the way the qualifying process works. Mauricio Pochettino can still eye second place as a possibility and it’s unlikely his side will take their foot off the gas for the visit of West Brom. Whether all is lost by the time they visit Palace, remains to be seen. The fact is though, hope remains and this season’s relegation battle may have one last piece of genuine drama. Michael Owen became the most expensive signing in the history of Newcastle United Football Club when he joined for a fee of around £16 million in the summer of 2005. Many predicted this transfer would help Newcastle in becoming a force in English football, and a club who would spend whatever was necessary to attract the best players and push for major honours. But, almost thirteen years have passed, and Owen remains the most expensive player in the history of Newcastle United Football Club. As transfer fees throughout football have grown exponentially, clubs have been forced to spend more in order to keep themselves in with a chance of cutting it among the best teams domestically and across Europe. Unfortunately for the loyal fans of Newcastle United, their club’s failure to make those big marquee signings could be the reason why they are no longer thought of as one of the big boys in English football. When Harry Clifton joined Newcastle from Chesterfield for a fee of £8,500 in 1938, the club broke their transfer record which had stood for ten years. This length of time between Newcastle breaking their transfer record was itself a record until 2016. In the summer of 2015, it was ten years since Owen had become Newcastle’s record signing and that equalled the time between Jack Hill and Harry Clifton. In 2016, the previous record was broken and this summer it will be thirteen years without the club breaking its record transfer fee. Newcastle had gotten close to matching the previous time between breaking their transfer record, with it being nine years between Alan Shearer and Michael Owen. Which was surprising, considering they broke their transfer record seven times between 1993 and 1996. Andy Cole became the first million-pound player in the club’s history when he signed for £1.75m in 1993. A year later, Ruel Fox and Darren Peacock both broke the record within a month of each other, and a year later Warren Barton and Les Ferdinand were also record breakers. Faustino Asprilla was signed for £6.7m in February 1996, but his record fee was shattered when Shearer joined the club before the start of the 1996/97 season. The £8.3m difference was a rise of 123.88% on the previous record fee paid out. Michael Owen’s transfer fee was over £1m more than what the club paid for Shearer nine years earlier and still remains as Newcastle’s record signing, much to the dismay of the Toon Army. When Owen joined Newcastle in 2005, his fee was nowhere near as much as the British or World record at the time. The British record transfer fee was £29.1m paid by Manchester United for Rio Ferdinand from Leeds United in 2002. The world record fee was £46.6m for Zinedine Zidane, who joined Real Madrid from Juventus for that fee in 2001. Since then, both of these records have been shattered several times and currently stand at £198m for the world record fee and £89.7m for the British record. That £89.7m is the record fee paid out by a British club, which was achieved when Paul Pogba joined Manchester United in July 2016. However, the overall British transfer record is the £105m Barcelona paid to Liverpool for Philippe Coutinho in January 2018. Taking football inflation into account, the approximate £16m paid for Owen would equate to around £80m in the market today, according to a recent Betway blog post. Newcastle have spent money in the transfer market since signing Owen, with three of their top five most expensive players in history being signed in 2015. However, taking the fact that Owen would be worth around £80m in the market today and he’s still their record signing, shows that the club have spent nowhere near enough to keep up with their rivals. Newcastle’s most expensive signing since Owen joined the club is Georginio Wijnaldum, who cost £14.5m from PSV in July 2015, and there have also been several players signed for around £12/£13m. Nobody expects Newcastle to be spending as much as the £80m Owen would reportedly be worth today, but their failure to bring in a marquee signing and at least keep up with most other bottom-half Premier League teams is a big worry for their fans. Only five Premier League clubs have a lower record transfer fee than Newcastle, with even historically tight spenders Crystal Palace and Leicester City having records nearing £30m. When Owen signed for Newcastle, the club were hoping to push on and constantly challenge for at least a top-six position. Now, they are in the bottom half of the table having last year been playing in the Championship. Their failure to keep up with other clubs in the transfer market could be the main reason why they haven’t fulfilled the promise they showed and why they haven’t gone on to become a force in English football. Relegation riot: who will be playing Championship football next season? While the battle for the Premier League title usually grabs the imagination of football fans, it is often the case that the fight to avoid relegation is equally compelling. This year’s relegation fight promises to be particularly fascinating. Usually, the tussle at the bottom involves perhaps six or seven teams, but this time around, we can make a plausible case for as many as 12 sides to end up in the Championship. Part of the reason for this is the increasing dominance of the big teams. Over the last few seasons, the typical Big Four of Manchester City, Manchester United, Arsenal and Chelsea has expanded to include Liverpool and Tottenham, and these six are engaged in what is almost a separate league. In the current season, Manchester City have been hoovering up all of the points on offer, while the chasing five have done their best to keep pace, and in the absence of one or two clearly inferior teams, the remaining points have been shared out more or less equally among the bottom 12. With 11 games to go, the gap between Watford in 11th and West Brom at the bottom is just ten points. How will this relegation battle develop? Here, we take a look at the main candidates to drop into the Championship. West Brom began the season with a couple of wins, but a run of six defeats in ten games saw the club act to remove manager Tony Pulis and replace him with Alan Pardew. Results, however, have not improved, and Albion’s problem is that they’ve already called on two men renowned for saving clubs from relegation – Pulis and Roy Hodgson. Meanwhile, they have continued to find goals hard to come by. In a typical year, they might be down already. If anything is going to save West Brom, it could be the ineptitude of their rivals, the closest of which is another former Pulis side – Stoke City. Like Albion, the Potters pulled the plug on the incumbent manager, but Paul Lambert has not proven much more successful than Mark Hughes, though he has managed to make them a little stronger defensively. One thing in Stoke’s favour is that they have enough winnable fixtures remaining to survive. If Stoke’s combative defensiveness under Lambert gives them a chance, the same cannot be said for Southampton. They secured a priceless 3-2 win at Albion last month, but that was their first win since November, and they’ve drawn too many games. Having stuck with manager Mauricio Pellegrino, it’s too late for the club to make a change now, and this inability to turn draws into victories could prove costly. Southampton’s plight is made starker by the recent improvements at Huddersfield and Swansea. After a solid start to life in the Premiership, the Terriers appeared to be heading back to the Championship following a run of six straight defeats in 2018, but a stunning 4-1 home win over Bournemouth stopped the rot, and if David Wagner’s players can continue to show that level of spirit, they can yet survive. The other bottom-five side who appear to be heading in the right direction are Swansea. Having dispensed with Paul Clement when the Swans were bottom of the table, they moved quickly for former Sheffield Wednesday boss Carlos Carvalhal, who has masterminded a stunning turnaround. Under his leadership, Swansea have lost one in seven, beaten Arsenal and Liverpool, and moved decisively out of the bottom three. It has taken Roy Hodgson slightly longer than Carvalhal to turn around his relegation-threatened team, but he seems to have Crystal Palace well organised, and they will surely be too tough to get sucked back into the relegation mire – comments that also apply to West Ham, who under David Moyes have only lost once this year. Brighton have proven to be a surprise package this season, and have managed to pull out enough good results to keep themselves clear of the relegation zone. What could count against them in a close-run battle is their fixture schedule, which pits them against Liverpool, Tottenham and Manchester United in their last four games. If they aren’t safe by then, things could be getting very tense on the South Coast. Bournemouth’s shock 4-1 defeat at Huddersfield may have rattled the Cherries’ supporters, but they have enough in their squad to avoid slipping into the relegation zone, and the same can probably be said for Watford and Everton. Newcastle’s safety, however, is very much up for grabs. The ongoing saga of the club’s sale and the lack of transfer investment has left the Magpies perilously close to the drop. What may count in their favour is the expertise of manager Rafa Benítez, who was able to engineer a crucial victory over Manchester United and is likely to have one or two more tricks up his sleeve that could keep them safe. Even if your club isn’t involved in the struggle, the desperate tussle to avoid slipping out of the Premier League basement offers plenty of drama and spectacle, and those who like to play the sports betting markets at this time of year are well aware that the fight to avoid relegation can sometimes lead to surprising results at big odds as lowly teams find an extra gear or an extra level of effort as they scrap for every single point. With so many teams potentially involved, almost every match from now to the end of the season will have relevance to the relegation picture, which should make for a thoroughly gripping and entertaining close to the season – unless, of course, your team is involved!